The mind-bending truth about the Doctor’s quest to clear his name is finally revealed! Featuring a stunning new adventure in the depths of the Time War, as Alice Obiefune comes face to face with the War Doctor! Plus: the final fates of the Squire, Abslom Daak and the deadly cult of Exterminhate! It’s an unmissable cosmic adventure, as gods live and die – and time itself is shaken to its core! Extraordinary writers Si Spurrier (Cry Havoc, The Spire, X-Men Legacy) and Rob Williams (Suicide Squad, Unfollow, Ordinary) join with superb artists Simon Fraser (Nikolai Dante) and I.N.J. Culbard (Wild’s End), to finish the Eleventh Doctor’s epic second year in comics – and nothing will ever be the same again…! 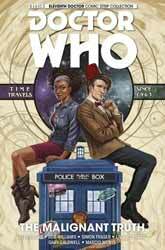 This volume collects #11-15 of Titan’s Eleventh Doctor comic – the final five issues of his second year with this imprint, and the culmination of an ambitious fifteen-issue saga. However, despite the series title and the cover illustration shown above, this is as much a War Doctor graphic novel as it is an Eleventh Doctor one. As we rejoin the narrative, Alice is trapped in the Time War, having piloted the Master’s wounded TARDIS back through the Time Lock. With the exception of a few flashback images of the Eleventh Doctor that appear on a scanner (like the recurring monsters’ “It is the Doctor” moments from Day of the Daleks and Earthshock), the first forty-odd pages of this book focus squarely on Alice’s interaction with the War Doctor and his companions. Alice bravely strives to save the Time Lord from himself, and passionately confronts a member of a Dalek death cult. “I wanted to stop the Doctor killing,” she tells the creature, “but now, having been here, after seeing where he comes from, what he’s seen the likes of you do… He’s 900 years old… How has he never given in to just slaughtering your sort? He always gives you a chance! Always! He must be so kind…” Well, he did try and wipe the Daleks out at the end of the Time War (or he will do – tenses get confusing when time travel is involved), but let’s overlook that detail for the sake of what is a very rousing speech! I keep on calling him the Doctor, as does Alice (as does everyone else, come to that), but the Time Lord points out that he doesn’t go by that name any more: “That name is dead and buried.” In fact, everyone here seems to have a title, such as the Squire, rather than a name as such – “That’s wartime for you” – and so it seems entirely fitting that the warrior should end up referring to Alice by her job description: librarian. And who is the little boy we have seen accompanying the hero? We find out in this volume – but I’m not telling! This part of the tale is illustrated by incoming artist I.N.J. Culbard (with Marcio Menys providing the colours). There’s a quality to Culbard’s work that reminds me of old-school artists like Jim Baikie, John M. Burns and Gerry Haylock, offering a strong level of realism even when depicting surreal events. See, for example, the fine anatomical detail as a giant, god-like hand reaches for Alice, or the bizarre designs of the Volatix Cabal. For these, writer Si Spurrier has called for the freakiest kinds of Dalek you have ever seen: “Narcissistic, eccentric, sadistic… a Dalek death cult of abominations, deliberately bred for disorder. Reviled by their own kind, tolerated only for the talent that no pure Dalek could possess: creativity.” And Culbard delivers – Spider Daleks, the Special Weapons Dalek and Dalek Caan all seem tame compared to these nut-jobs! (I do wonder, though, whether the almost unrecognisable look of these Exterminhaters is in order to work around some copyright issue.) The artist also gives us a suitably craggy and world-weary likeness of John Hurt as the War Doctor. During the middle section of the book, Culbard and Menys make way for the returning art and colour team of Simon Fraser and Gary Caldwell. When two very different artists share the workload, you can almost inevitably see the join – and artists don’t get much more different than Fraser’s exaggerated dynamism versus Culbard’s fine-line realism. Fortunately, the division of labour is managed well here, with Fraser handling the ‘present day’ parts of the story, featuring the returning Eleventh Doctor and Abslom Daak (yay! ), and Culbard continuing to render the Time War scenes. Bringing together the Eleventh Doctor and the Time War poses potential problems, of course, because he and the War Doctor will subsequently meet (later in life for both of them and yet apparently for the first time) in The Day of the Doctor, so how can they cross paths here without causing a major continuity headache, or at the very least upsetting the dramatic arc of that 50th anniversary special? In the name of peace and sanity, writer Rob Williams manages to navigate this complexity with great aplomb. I hope you’ve been paying attention, because the final furlong of the tale takes us right back to where this arc began in The Then and The Now – back to the Palliative Ark of the Overcaste, where Psychic Moderators attempt to keep the terrifying Malignant at bay, where the survivors of its previous attacks wait to pass judgement on the Doctor for his crime and unleash the Temporal Agoniser upon him, where a judge with a busted nose once swore that “Bengeance shab be ours, Doctub!” All of these things have a part to play in a scheme that has a horrifying sense of the inevitable to it. There are some particularly gruesome depictions from Simon Fraser in this section. There’s what happens to Abslom Daak, for a start. There’s what happens to the long-suffering Overcaste. But most of all, there are the hideous contortions of a Volatix Cabal sleeper agent (a creature that foreshadows the Dalek puppets seen in the Eleventh Doctor’s final series of television adventures) as various very recognisable appendages poke sickeningly from its mouth, eye sockets, nose, and other parts of its body. Following such an excellent build-up, I regret to report that I found the conclusion of The Malignant Truth to be disappointingly deus ex machina. Certain seemingly dead characters are resuscitated via medical technology – though these resurrections certainly have their poignant and amusing moments. The Doctor is shown to be a manipulative old so and so – which we knew already, and has been discussed in previous episodes in this saga. Meanwhile, the Malignant is noticeably inactive and all but forgotten about during nine explanatory pages. Maybe I’ve just been spoiled by the quality of the previous arc’s finale, which was riveting, moving and utterly satisfying. From a lesser comic-book series, what transpires in this volume might have seemed enough, but from the master craftsmen Spurrier, Williams and Fraser, the truth is that I expected more. For the most part, though, this is an excellent compilation, full of exciting visuals, compelling character moments and dramatic revelations.